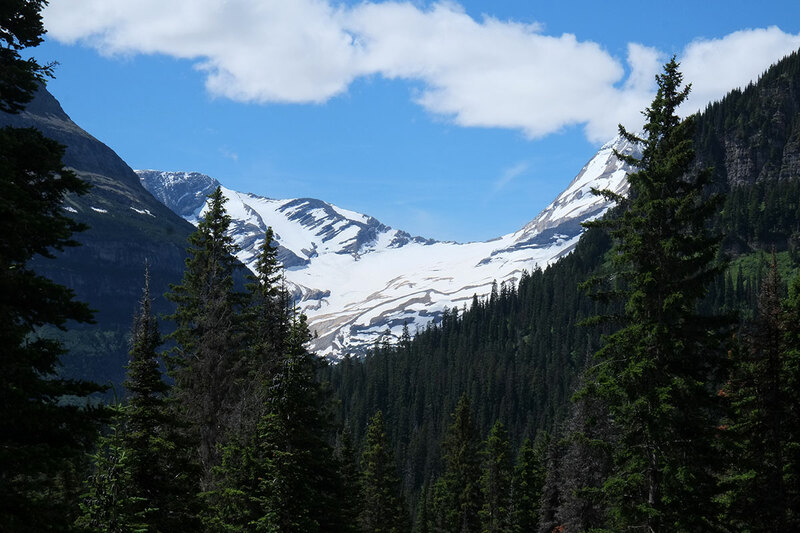 Glacier Park can best be visualized as a node in the Rockies, where the Livingston Range and the Lewis Range come together. 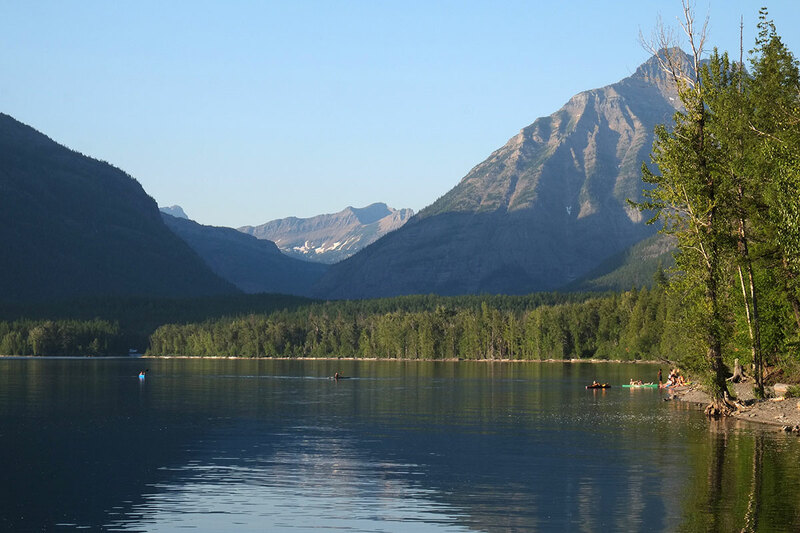 There are four deep valleys which cut into these ranges – Lake McDonald from the west, Two Medicine from the southeast, Saint Mary Lake and Many Glacier from the east – and where most of the national park facilities and development are located. The astonishing bit of engineering that connects Lake McDonald and St. Mary across the middle is the Going-to-the-Sun Road, which climbs 3500 feet from Lake McDonald to Logan Pass, the literal highpoint of the experience for most visitors. We learned in advance that large vehicles and trailers aren’t allowed on this road, so we decided to split our time between four nights on the west side at the Fish Creek campground, and four nights on the east side, at the St. Mary campground. You can drive your own car on this road, although it is almost impossible to find parking at any of the popular trailheads. A shuttle service began a few years ago, similar to those in place at the Grand Canyon and Zion, and you can take this from either the west or east sides. The west side of Glacier is the more peaceful, less rugged part. 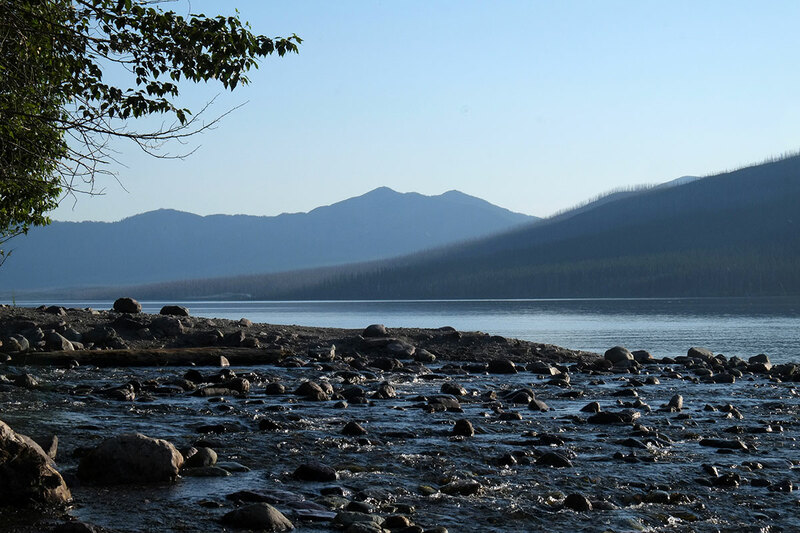 The ten-mile-long lake is surrounded by wooded mountains, some of which have burned in recent years. 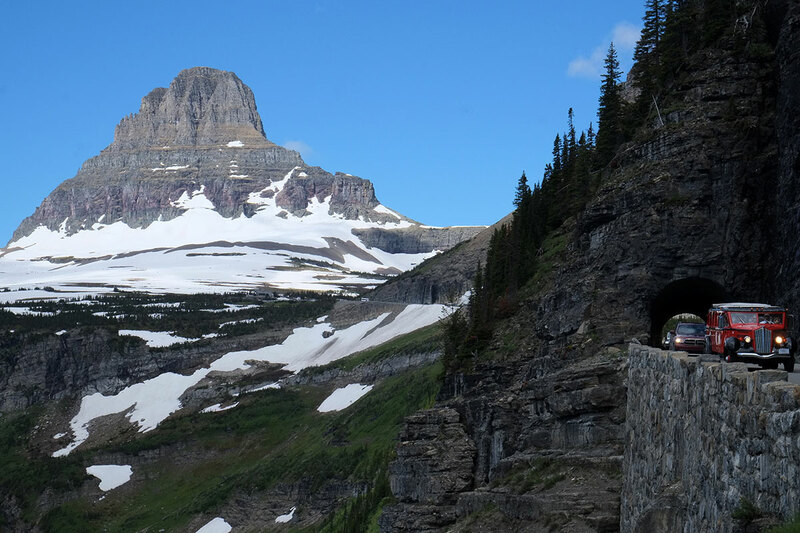 The higher elevations to the east are glimpsed through the gap where McDonald Creek and Going-to the-Sun Road climb up to the Continental Divide. Hanging out by the lake is quiet and serene – the light is beautiful, and the colors of the water and the mountains change throughout the day. 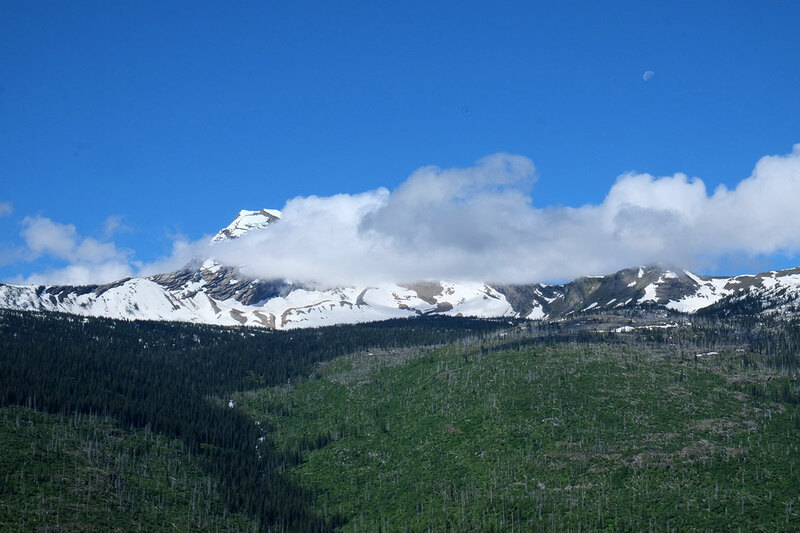 The west side doesn’t have the spectacular alpine scenery, breathtaking climbs, and higher-altitude views of the east side. And being 1500 feet lower and on the west side of the ridge, it is the wetter, more temperate, more heavily forested part. (Whereas the east side is usually colder, dryer, and much windier.) 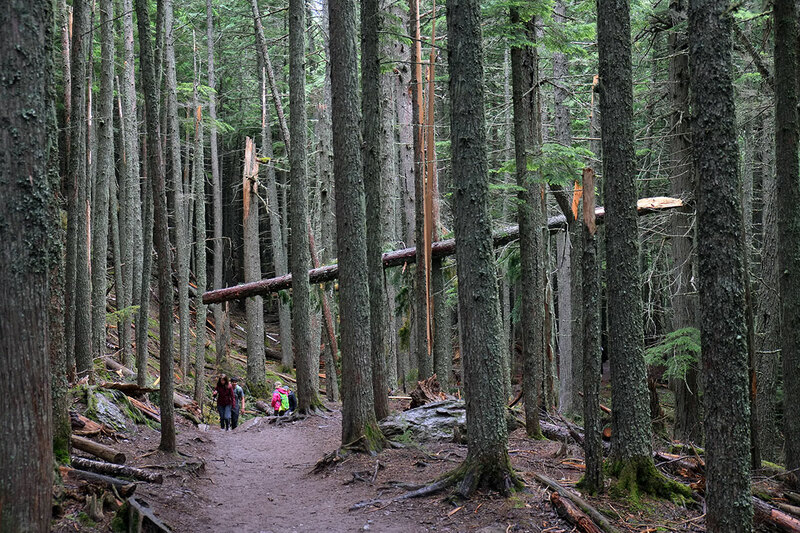 We also found that the dayhikes were mostly of two types – very short and flat (under 2 miles and 500 feet elevation change), or pretty long and steep (over 8 miles and 2000 feet). 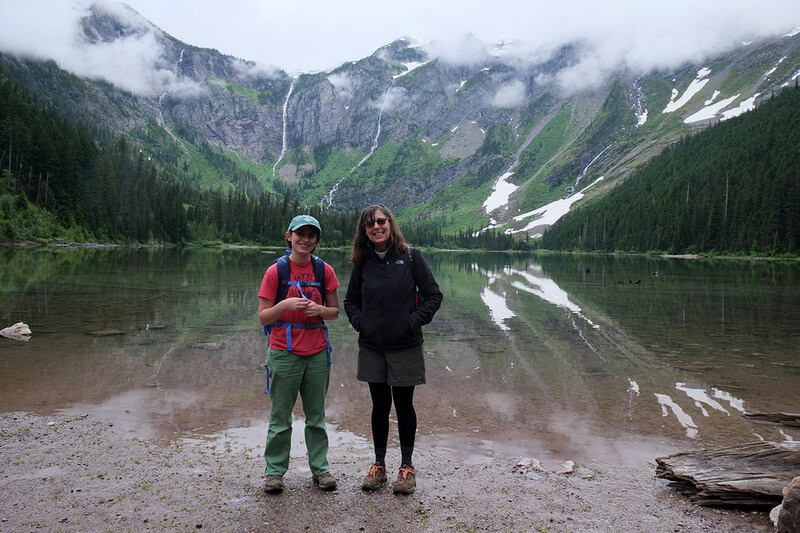 Given our general out-of-shapeness, Linda’s complete inexperience with mountain climbing, and our prior incidents with altitude sickness in the Southwest, we were looking for moderate dayhikes, which were hard to find. By the end of the trip, we had done every hike with which we felt comfortable. The one moderate hike on the west side was to Avalanche Lake. It was a cool and damp day (so it felt like home), and we ascended along a creek, which had made some spectacular cuts through the rock. There were lots of trees down in the forest, and a ranger informed us that there had been a big avalanche a few years ago on the opposite slope; when the snow hit the bottom of the slope, all the air pockets blew out and created a 100 mph wind up the slope, which had blown these trees uphill. 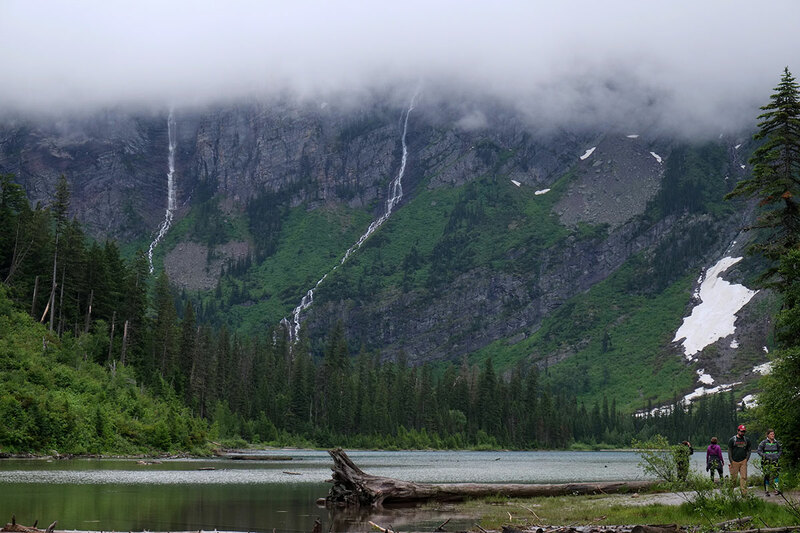 When we reached the lake, there was this view of waterfalls running down out of the sky, as if the clouds were being drained. After a while the overcast lifted, and we could see that the mountains did indeed have peaks. The weather turned sunny and warm, and we decided to drive up the Going-to-the-Sun Road. It climbs the slopes in a series of moderate traverses, with only one hairpin-switchback. There’s a huge drop below you on one side, and a sheer cliff above you on the other. Pullouts allow you to stop and gawk at the awesome scenery. 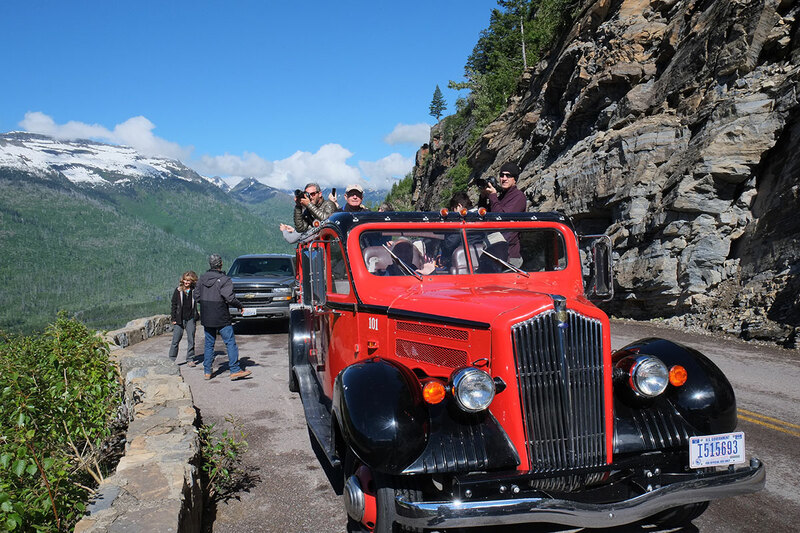 Back when Glacier first opened (in 1910), most visitors arrived by train, as the roadway system developed, they were ferried around by these “Jammer” cars, which have removable tops so you can enjoy the scenery above. These historic vehicles were all recently renovated, and are still used by those who don’t want to drive themselves. On the right you can see the Weeping Wall, where a rock face is always disgorging groundwater onto the road. and then see the sweeping panorama above the St. Mary valley. The Jackson Glacier overlook affords a good view of one of the remaining high altitude glaciers. Overall, it is one of the most amazing drives in the country. The views are spectacular in every direction, and although the parking lots are almost always full, there are enough pullouts where one can stop for a while. But the roadway is very narrow, and somewhat scary; Linda moved to the middle seat in the truck, as she really didn’t enjoy sitting out there on the edge. To move the trailer from west to east we had circle around the south side of the park, but due to road construction and more unexpected vehicle restrictions on Route 49, we had to drive all the way east to Browning, which is the center of the Blackfeet reservation (and their bison reserve). and a glimpse of life on the reservation (we hadn’t been on a reservation in two years, after a lot of time spent with the Navajo, Hopi and others in the Southwest). We finally arrived at St. Mary, the jumping-off site for the east side of Glacier. This entry was posted in landscape on July 15, 2018 by Peter.